This is a relatively rare cat breed (new window) created in about 1980 (in the UK) and developed thereafter. FIFe is the major cat registry that recognizes this cat breed. Some other associations don’t recognize the breed. This may be because they believe that this breed is not sufficiently differentiated from other breeds to justify registration as a separate breed. This is just my thought. FIFe is an international cat fanciers’ society. Its members are affiliated autonomous societies or associations located in 39 countries, the majority of which are in continental Europe (mainland Europe). They also have 3 honorary individuals who are members. The Seychellois would therefore be mainly found in Continental Europe. 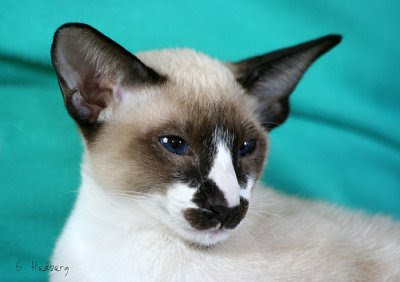 Under FIFe rules a Balinese (long haired Siamese) and Siamese cat (the Modern, extreme, Siamese and short haired) with white patches of fur is called a Seychellois cat. The Seychellois can be both long haired and shorthaired to reflect this. 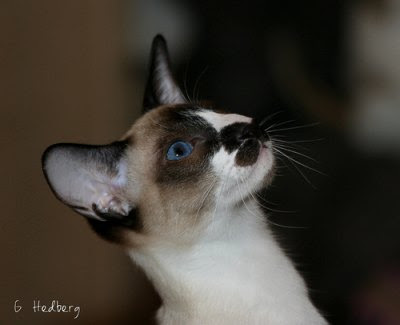 The Siamese and Oriental cats are grouped together under FIFe registration. 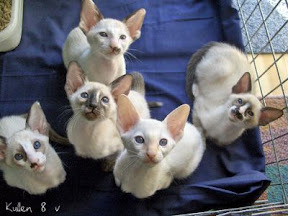 These are the Balinese, Siamese and Oriental Shorthair and longhair. This cat is therefore a pointed and white cat under FIFe rules. The better known pointed and white cat is the Snowshoe (opens new window). 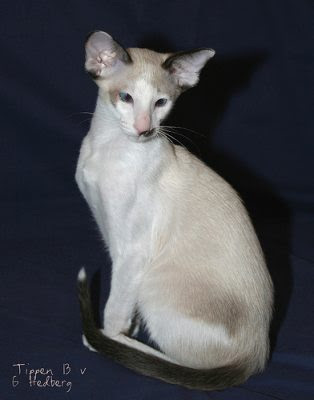 Sarah Hartwell says that this cat breed has a Van pattern and is a Van-patterned Oriental cat. But this appears not to be the case with respect to the FIFe breed standard, which states that the coat should be pointed with white (as illustrated by Gunnel Hedberg’s cats on this page). The van pattern is best demonstrated on the Turkish Van cat. The Van pattern is caused by the action of the piebald or white spotting gene, which in restricting the migration of pigment producing cells from the spine outwards during the embryonic stage, typically produces the bicolor pattern (the Van pattern is a bicolor). The extent of the effect of the gene is graded from 1-10. Grade 1 means almost solid black and grade 10 the converse; almost solid white. This grading system is reflected in the classification of three types of Seychellois cat. Seychellois Neuvième (French for 9th) is more white than the others, being a white cat with a colored tail and patches of color on the head. Seychellois Huitième (French for 8th) is a white cat with a colored tail and patches of color on the head and legs. Seychellois Septième (French for 7th) is also a white cat with more color than the other two having color patches on the head, legs and body. As can be seen this cat is similar in conformation to the Modern Siamese, svelte, slender, elegant with long lines and an elongated wedged shaped head but less extreme than the Modern Siamese on the basis of Gunnel’s cats illustrating this page. Despite being slender, the body is muscular. The head profile should show no nose break (the angle where the top of the nose meets the forehead). The ears should be large, as illustrated. The neck should be long and slender (perfectly demonstrated in Gunnel’s cats) and the legs long, fine and in proportion. As can be clearly seen the coat is very short, fine and silky. This reminds me of the Havana Brown in terms of texture and density. The coat, being so short indicates that there is virtually no undercoat so I’d expect minimal matting and relatively low coat maintenance. 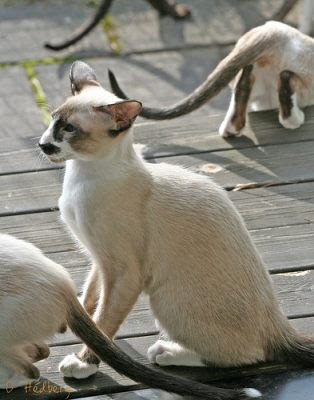 Gunnel runs the cattery Yum-Bo’s which breeds Siamese (Modern Siamese to me), Orientals and Seychellois cats. The cattery is located in Sweden. She has very kindly allowed me to publish his fine photographs here, for which I am very grateful. Her cats are delightful. This entry was posted in Seychellois cat and tagged Seychellois cat by Michael Broad. Bookmark the permalink. Nice site, I like the stuff you do but just a friendly advice. Thank you very much indeed. For some reason I always felt that it was a man’s name. Don’t know why! Now I know.